Seven years after civil war erupted in 2011, it appears Syria is beginning to emerge from a dark period of death and destruction. Any recovery may be hampered, however, by what analysts say are signs of a crisis that is looming over water and how it is managed, which could mean the difference between peace or new conflicts — internal and regional — in the future. Land along the Euphrates River, which runs through modern-day Turkey, Syria and Iraq — also known historically as the Fertile Crescent — has been hit by water shortages, drought, and poor crop yields. FILE - A view of the Euphrates River from al-Bugilia, north of Deir el-Zour, Syria, Sept. 21, 2017. To increase hydro-electric production and improve irrigation in arid parts of Anatolia, Turkey began building a series of 23 dams starting in the 1980s, reducing the amount of water that could be used for agriculture downstream in Syria and Iraq. Turkish leaders unilaterally annulled a water-sharing agreement with both Syria and Iraq in 2014. 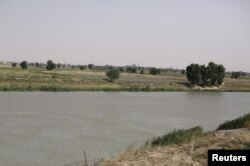 "They were supposed to allow 500 cubic meters per second of water through to the Euphrates and they reduced that down to 200 meters," Marcus King, a specialist on environmental security at George Washington University in Washington, told VOA. Decreased flow from Turkey, seven years of fighting, and mismanagement of water resources in many parts of the country, have hit farming hard in Syria. A severe drought from 2006 to 2010 also caused tens of thousands of Syrians to give up agriculture, creating an army of idle young men that may have helped ignite the conflict that began in 2011. Joshua Landis, who heads the Middle East program at the University of Oklahoma, said the four-year drought "caused immense suffering in Syria," and forced more than a million people to leave their farms in eastern Syria and to migrate to cities or the edge of cities. "It was that population," Landis said, "that in many ways laid the groundwork for civil war." FILE - People queue as they fill containers with water in the government controlled al-Rabwah area, a suburb of Damascus, Jan. 10, 2017. The drawn-out conflict has damaged or destroyed water networks and infrastructure in Syria's two largest cities, Aleppo and Damascus, as well as in the provinces. Militant groups that controlled water plants and reservoirs upstream periodically used those assets to blackmail their opponents in urban areas. "There have been various sub-national actors [who] have monopolized water for their own purposes, mismanaged water," said King. He argues the Kurds, who hold sway over large swathes of northern and eastern Syria, control large segments of the Euphrates River, including the Tabqa Dam and Lake Assad. FILE - This photo released on March 27, 2017 by the official Twitter account of Operation Inherent Resolve, shows the Tabqa Dam, in Raqqa, Syria. Observers say the Syrian government did not allocate water resources equally to all regions of the country before the war, giving more to some sectarian groups, such as President Bashar al-Assad's Alawite sect. To avoid future conflicts, he says, the government must avoid favoritism when it rebuilds and repairs its water network. "If the reconstruction isn't done in an equitable way, this will lead to further tensions and cleavages within Syria itself as it begins to recover from conflict," King said. Syrian analyst Nabil al-Samman agrees. In a recent article in the Saudi-owned Asharq al-Awsat newspaper, he wrote that water could be the catalyst for future conflicts between regional states, including Syria and Turkey. Syria and Turkey already fought a long guerilla war, starting in the 1970s, using the Kurdish PKK militia group as a proxy. Joshua Landis recalls that former Syrian President Hafez al- Assad "gave [Abdallah] Ocelan, the PKK leader, an office in Damascus and helped the Kurds in their insurgency in [Turkey's] eastern Anatolia," he said. "That [was] a war and it was done in part because Turkey began to dam up the Euphrates, and Assad was angry and he did not know how to get them to stop." That option broke down, though, as regional powers entered the fray of Syria's civil war, when the country's many militia groups, often armed and supported by neighboring countries, preferred force over negotiations. Going forward, Marcus King worries more about internal than external conflict for Syria. "What worries me," he said, "is some of the sub-national factors, some of the internal inequities and cleavages and disagreements that could lead to conflicts over water." Tempering concerns about the frictions between Turkey and Syria, King and others note the last war fought exclusively over water in the Levant dates back to antiquity, and he doubts a new one is likely.